Welcome to another edition of Where We Live. 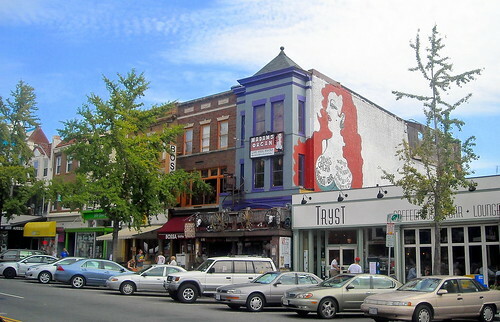 This week we’ll be covering the ins and outs of one of the District’s coolest neighborhoods, Adams Morgan. Adams Morgan is unique in DC in that it actually feels like a neighborhood during the weekdays and weekend days, and completely changes character on weekend evenings as it transforms into a concentration of drunk non-residents. Unfortunately, some people only ever see the drunken frat party of 18th Street in Adams Morgan and don’t get to understand the really wonderful neighborhood behind it. Here’s your chance to learn what else there is to it! History: Adams Morgan gets its name from the two formerly-segregated elementary schools in the area, the all-white John Quincy Adams school and the (now closed) all-black Thomas P. Morgan school (therefore, the area is not actually called Adam’s Morgan or Adams’ Morgan, both of which I’ve seen everywhere). In 1956 the Adams-Morgan Better Neighborhood Conference formed to improve the neighborhood, and jump-start urban renewal (not the Southwest Waterfront kind, though). Interestingly enough, the neighborhood’s name was hyphenated as Adams-Morgan in the Washington Post up until 2001. Neighborhood Character: Adams Morgan is one of those few areas close to downtown that actually feel like a neighborhood. Ilana, an Adams Morgan resident of 4 years, had this to say: “I know my local grocery store clerk and the liquor store guy and I recognize most of my neighbors that have been in the area for a while. I also love the diversity, both ethnically and socially.” A variety of housing is nearby, mostly in rowhouses that have been subdivided or in smaller apartment buildings, and the main commercial hub is at 18th Street and Columbia Road. While 18th Street is home to more bars and restaurants, Columbia Road is home to more of the neighborhood places– smaller restaurants, a Safeway grocery store, and a number of local businesses. Ilana says the best time to get a true feeling for the neighborhood of Adams Morgan is “on a nice Saturday afternoon when it’s not too crowded, all of the bars are serving cheap and delicious brunch, the local markets (while small) are all set up (farmers market/crafts market/hispanic market), and it’s really pleasant just to walk around.” Friday and Saturday nights, the neighborhood becomes overrun with jumbo slice-fueled debauchery, and the sidewalks become jam-packed with college students/interns/recent grads in various states of inebriation. Transportation: Lots of good transportation options here, with the exception of an awkwardly-placed Metro station. The area is served by a number of bus lines, including the 42 (to Metro Center/Mount Pleasant) and the 90/92/93/96 that connect the area across town to SE DC. The new Circulator connects Adams Morgan to Columbia Heights and Logan Circle, and since it only has a few stops, it’s one of the fastest ways to get to the area. There are plenty of Zipcars (over 20 within a few minutes’ walk of 18th & Columbia), bike racks and an ever-expanding network of bike lanes, and nice wide sidewalks that make it one of the most pedestrian-friendly neighborhoods in town. In fact, the corner of 18th & Columbia & Adams Mill & Calvert recently underwent a major facelift to become even more pedestrian-friendly. What to See: Assuming you’re checking out the neighborhood at a time that isn’t a Friday or Saturday night, here’s what to see. There are so many great restaurants and bars in the area. Meze is great for brunch, tapas, or just mojitos; The Reef is great for drinks on the rooftop; Madam’s Organ (love that name!) has great BBQ, a rooftop deck, and live music; Perry’s has a great drag brunch and great sushi/tapas on a beautiful roof with a fantastic view of Adams Morgan; Tryst is the place to go for good coffee and great ambiance. Pasta Mia is that place on Columbia where you constantly see people waiting outside– it’s great Italian food but they don’t take reservations, so you’ve gotta wait outside until it’s your turn. It’s definitely worth the wait though! The Marie Reed Recreation Center is open weekdays and has an indoor swimming pool, as well as tennis courts and a basketball court. It’s free if you’re a DC resident! The Adams Morgan Day Festival is coming up on September 13th. Mark your calendars for a day of great food, live music and performances, and local crafts and art. There are also free summer concerts every Saturday from 5-7 at the BB&T Bank plaza. A little-known event that even neighborhood residents don’t know about is Adams Morgan First Tuesdays. On the first Tuesday of every month, a number of Adams Morgan restaurants serve food and drink for two for just $25, and select Adams Morgan retailers offer discounts of 10 to 35 percent. It’s a fantastic deal, so definitely check it out! Adams Morgan NOW is a great website for neighborhood events and information on neighborhood establishments. It’s managed by the Adams Morgan Main Street Group. The Adams Morgan Partnership is a business improvement district that keeps streets clean and safe, and develops marketing programs for the neighborhood. AdamsMorgan.net is an online depot of information, but it’s fraught with misspellings and looks like it hasn’t been updated since taxi time-and-distance fares went into effect. My Adams Morgan seems to be on a hiatus at the moment, as nothing has been posted since December. There are good restaurant reviews and some good neighborhood information in the archives, though. Why We Love Adams Morgan: DC has a reputation for being buttoned-up and stuffy, but Adams Morgan is none of that– it’s eclectic, multi-cultural, fun, and very real. It’s full of “great restaurants, fun bars, funky coffee places, basketball courts, inviting parks” and more, according to resident Chris. The neighborhood is a great mix of residents from many different backgrounds, and if you want to get completely sloshed a variety of fantastic bars are a short walk away. It’s got it all! i moved to AM a few months ago and i love it…haven’t been to bourbon yet but now it’s definitely on my list! and seriously don’t miss perry’s, that place is fantastic. i think my favorite thing about the neighborhood is the abundant access to area parks. there are several nearby entrances to rock creek (the entrance next to the AM metro is especially nice), kalorama park, and meridian hill (with the sunday drum circles!). lovely. 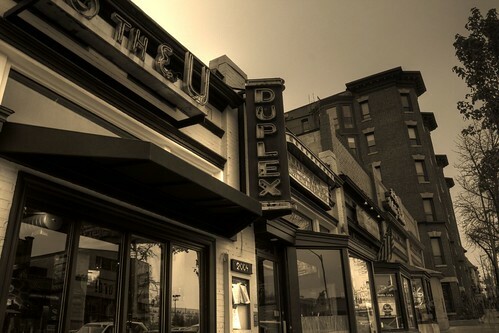 My first solo apartment was in Adams Morgan at 19th & Columbia… fun times (except the parking!! )… my favorite part of living there was the extreme contrast between daylife and nightlife. Best Adams Morgan historical tidbit? The Knickerbocker Theater destroyed by major blizzard in 1922, at 18th & Columbia. One of the top Washingtonian disasters. Adams Morgan, where the bridge and tunnel crowd come to douche it up on the weekend. Why start this series with Adam’s Morgan when there are so many more authentic DC neighborhoods such as U street or the H street corridor, or even eastern market / barracks? Thanks, Tiffany :) rl and anyone else, I’m happy to profile any other neighborhoods you have in mind– leave a comment with which neighborhood you’d like to see next! 2) The 9 story, 180,000 square foot, 150 room privately funded Marriott Edition boutique hotel coming at Euclid and Champlain Streets. The 18th Street Streetscape has been in the works for many years and construction begins this October. This massive 15 month project will include: wider new tinted exposed aggregate sidewalks with granite curbs and brick gutter pans, two through lanes with one center lane, return to parallel parking, new trees and tree boxes, new street lamp posts, new benches, bike racks, new crosswalks with rounded curb extensions (bulb-outs) at all street and alley intersections, and a host of other improvements and traffic calming measures. Fix-er-up row houses on Kalorama and Ontario Roads have sold in the past two months in a matter of days at prices above their list prices. Three posh loft condos have sold for over a million dollars on Champlain Street. In a short two years you won’t recognize Adams Morgan as these two big changes will dramatically alter the neighborhood and be the catalysts to garner incrementally more private investment in the years to come bringing positive, up scale change one address at a time to this area. Just because the “B&T crowd” or any other come in to a neighborhood to party doesn’t make it any less “authentic.” People do live there. People come into U Street to party as well, does that mean it’s not authentic? Not sure what you meant here, rl. I say H street / noma / near north east, what ever you call it. I absolutely agree with shannon and her friend chris! I moved to Adams Morgan from the suburbs last summer. I really wasn’t psyched about Adams Morgan since all I really knew about the neighborhood was what I had seen on Friday and Saturday nights – but I found a great apartment and it was near so many other distinct neighborhoods that I moved in anyway. Now I’m a total convert! It truly is a pleasant place to live – weeknights are fantastic as most of the restaurants along 18th St have outdoor seating, and lots of neighborhood families go out to eat. I never thought of Adams Morgan as anything more than a late night bar scene until I moved there. But there are tons of great restaurants and local stores, I LOVE Meridian Hill Park, U St is so close by, and the S buses will take you from the White House to Silver Spring. If the bars and restaurants exist primarily to support weekend refugees from the burbs, then yes it does effect a neighborhood’s authenticity. It’s there to support people outside the neighborhood, and not the locals. That’s not a neighborhood, that’s a weekend tourist trap for weekend tourists from the suburbs. The b&t crowd define the neighborhood more than the people who live there. But whatever, if that appeals to you then great, I’m not going to convince you. Adams Morgan has its’ own appeal, just like an ESPN zone, or George town, it just doesn’t appeal to me. But what do I know, I’ve never lived there. Have you been to Adams Morgan anytime other than a weekend night? If you’ve never lived in Adams Morgan but have come as a “weekend tourist”, you may as well be a “B&T” yourself. And as Jenn commented, most neighborhoods in DC receive their share of weekend tourists. Capitol Hill I’d say is an authentic neighborhood. As is U Street. Also, if you’ve never been to a place other than to visit the bars, how can you comment on its authenticity? If you think the bars and restaurants are there to only cater to weekend tourists, where do you think all of the residents who live in the rowhouses and apartment buildings in the neighborhood go to? Its not like the area is a void with no residents except weekend nights.